Disclaimer: As a licenced amateur radio operator, I am publishing this information for the use and benefit of the ham community. If you are an 11-Meter 'freebander' and are reading this page, I strongly encourage you to become a licenced ham and cease illegal operations on 11 Meters. If you write me with a question about modifying your radio or where to buy an amplifier, without providing a verifiable ham callsign, I will not answer your email; furthermore, your email will be forwarded directly to the Federal Communications Commission, or to the radio regulatory agency of your country. I do not support or encourage any sort of illegal 11 Meter operations. Arguably one of the most popular ham radios ever made was the Uniden President HR2510 mobile 10-meter transceiver, and it's cousin, the Radio Shack/Realistic HTX100. They are probably among the most modified, as well. On this page I will detail the results of some of my tinkering with these rigs. It is not my intention to cover ground that has already been covered by others; there are many fine resources on the web describing various mods and enhancements to these rigs. What will be covered here is information that I have found through my own experiments that I have not seen covered elsewhere, as well as my own opinions on some of the other published mods. Over the years, I have talked to several people who have owned both the HR2510 and the HTX100. The comment inevitably comes up that the HTX100 has a 'better receiver' that the HR2510. But how can this be? Everyone knows that the 2510 and the HTX have virtually identical RF sections. When I finally managed to acquire an HTX100 last year, I decided to investigate to try and prove or disprove this notion once and for all. Examination of the schematics for both radios showed that the RF sections were indeed almost identical. I reasoned that the 2510, being an 'allmode' radio with AM included, may use the common CB radio design practice of having a wider 'compromise' IF crystal filter to improve the RX audio response on AM. The center frequency of both filters is 10.695 MHz, so assuming that the carrier oscillator signal is placed on the slope of the filter, a check of the carrier oscillator alignment frequency for USB should tell us the approximate bandwidth of the filter. Sure enough, the USB carrier oscillator frequency is different in the two radios! Shown below is a chart of the carrier oscillator frequencies for both rigs, with a LSB value extrapolated for the HTX100. What does this tell us? If we assume that the USB and LSB carrier frequencies represent the edges of filter, we can see that the 2510 has a 5 KHz wide filter, while the HTX has a 3 KHz filter! This is enough to make a noticeable difference in the performance of the receiver. The next step was to try to verify this theory on the test bench. I connected each radio to a signal generator, and attached a digital voltmeter to the output of the AGC rectifier as a quick and dirty measurement technique. I then stepped across signal generator frequency in 100 Hz increments using the main tuning dial and recorded the AGC voltage at each step. The results are shown in the graph below. 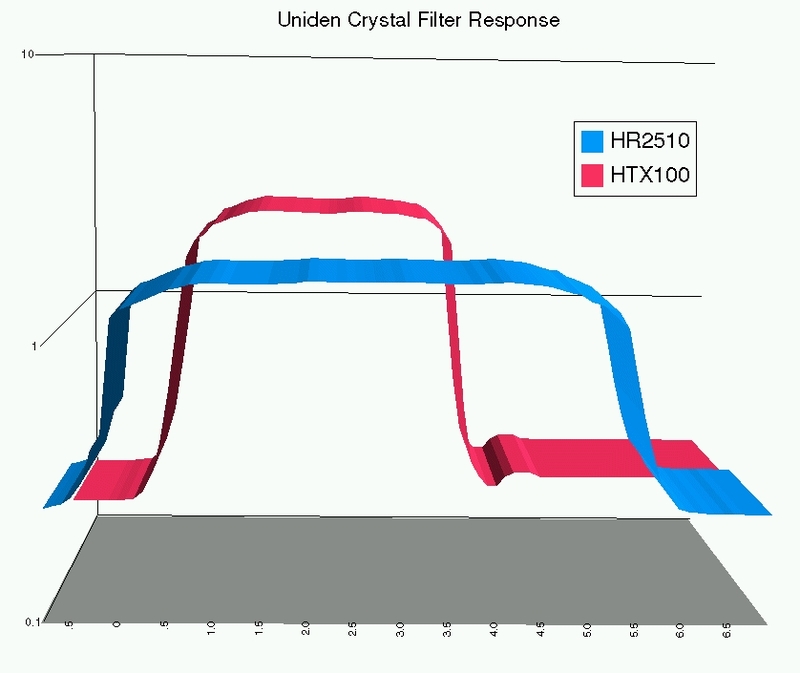 The filters are physically identical, and the HTX100 filter is available through Radio Shack Parts for around $55. The part number from the service manual is BFLY0285001, and the Radio Shack SKU is RSU10569036. Be sure to give them the HTX100 catalog number, 19-1101, as well. You can also swap filters with an HTX100, and realign the HTX's carrier oscillator accordingly. This filter is not available directly from Uniden, I tried. The only downside to this mod will be that, since the frequency offsets for the display readout are controlled by fixed values in the CPU microcode, your frequency display will be off by 1 KHz in both USB and LSB modes. AM, FM, and CW will display normally. The Chipswitch replacement CPU will not compensate for this either, and the people at Chipswitch haven't shown any interest in releasing a new version to allow for this mod. I have come up with a fix for this for USB by shifting the RIT voltage. I did not concern myself with fixing LSB, since 99.999% of all 10-meter sideband activity is USB anyway (and we all use our 2510's strictly on the ham bands, right?). If you operate quite a bit of AM, you will notice that AM signals do sound more muffled with the narrower filter. This is normal, and can be compensated for somewhat by off-tuning the signal a little with the RIT or the main dial. If you operate a lot of AM, however, this mod may not be for you. I always thought the RX audio on the 2510 sounded a little wimpy, even with an external speaker. Rogerbird has a good mod on his web site to increase the overall gain of the audio stages, but I didn't think this was my problem. A sweep test of the audio chain from the collector of Q109 to the speaker showed an overall response of about 390 Hz to 2600 Hz. OK on the high end, but a little restricted on the low end. The main limiting factor on the low end seems to be the R/C filter network made up of C105, C107, and R148, located between Q135 and IC103. I paralleled C105 and C107 each with a high-quality computer grade .1 uF capacitor, and this seemed to extend my low end cutoff point to about 280 Hz. There are lots of good descriptions of mods floating around to enable the RIT to function on transmit, so I won't re-invent the wheel here. Rogerbird has several listed on his page. The only thing that I can add is that I placed a short across diode D160 when I did my mod. It isn't needed any more once the RIT is enabled for transmit, and may introduce some non linearity on the low end. Note: DON'T follow the alignment instructions for Mod #1 on Rogerbird's RIT page. These adjustments control the frequency of your carrier oscillators, and will knock your audio out of whack if not adjusted to spec. Use the instructions in Mod #3 or Mod #4, they are correct. I always wondered why, when we have a radio that tunes in 100 Hz increments on the main dial, everyone seems fascinated with having 3-5 KHz of 'slide' on the RIT control. Seems kind of silly. My preference was to reduce the range of the RIT circuit by placing a 22 K resistor in series with the high end of the RIT pot and a 10 K resistor in series with the low end. This reduces the overall tuning range of the RIT quite a bit, and makes fine tuning a lot less touchy. You can see this mod in my schematic of the RIT shifter for the crystal filter mod. It's just personal preference on my part, but that tiny knob doesn't make a real great VFO. Did you ever wonder what those 2 extra adjustment pots on the synthesizer board are? The HR2510 service manual makes no mention of them, but the HTX100 service manual tells the secret: they are balance adjustments for IC304 and IC305. To adjust them, you need a good scope with at least 60 MHz bandwidth (100 MHz would be better). Preset the rig to 29 MHz. Connect the scope to TP305, and adjust VR302 for the cleanest sine wave. Repeat using TP306 and VR301. That's all there is to it! Anyone who has opened a 2510 has noticed the melted plastic of the LCD holder around the display lamp. This seems to have been a major design screwup on Uniden's part. My solution to the problem was to drill several small holes in the top and sides of the LCD holder for cooling. I then removed the stock lamp and suspended a pair of 12v micro-lamps (272-1092) from Radio Shack through two of the holes in the top. Since I never liked the ugly amber color that Uniden chose for the backlight, I topped it off by making a red filter to fit behind the LCD unit from a red Rolodex plastic card protector (item #67649), available in a pack of 5 colors from your friendly office supply store. (Note: the blue ones work nice in vintage Drake gear). Inserting the red filter requires careful disassembly of the LCD holder, so don't try this if you are all thumbs! The result is a pleasing, evenly lit red display that is easily visible under most lighting conditions. Even if you don't go the full route and install new lamps with a different color filter, the cooling holes in the LCD holder are probably a good idea. This is where I get to express my opinion of some of the other mods floating around out there. Constructive comments are welcome; flames will be ignored. An abomination. Don't do it. My 2510 had this mod in it when I got it. It just so happened that I lived two blocks from a grain elevator at the time, and the truckers waiting to offload their grain liked to sit on CB and yak. Any time one of them would transmit, the entire band range of the 2510 would be blanketed with white noise. This was caused by the use of switching diodes across the IF crystal filter in this mod. Under strong signal conditions, these diodes began to break down and effectively killed the selectivity of the radio. If you want repeater splits, get a Chipswitch. It's a much better solution. Highly recommended. What more can I say? You get memories, repeater splits, and 12 Meters too! I bought mine from the friendly folks at Bill's 2-way. Bill Nadzam was very patient in working with me on a problem that it turned out was of my own creation. You can't go wrong with these folks. Another don't, if you respect your fellow hams. Contrary to what seems to be a popular belief, the ALC is not there to prevent you from gettting a couple of extra watts out; it is there to keep your transmitter operating within it's linear region so you don't distort and splatter all over the band. That extra couple of watts will never make it to the guy on the other end, but it will sure tick off your neighbors. The same concept applies to the AMC for AM. You might sound a little louder due to audio clipping, but anything over 100% modulation just goes into splatter and your signal won't sound as clean. 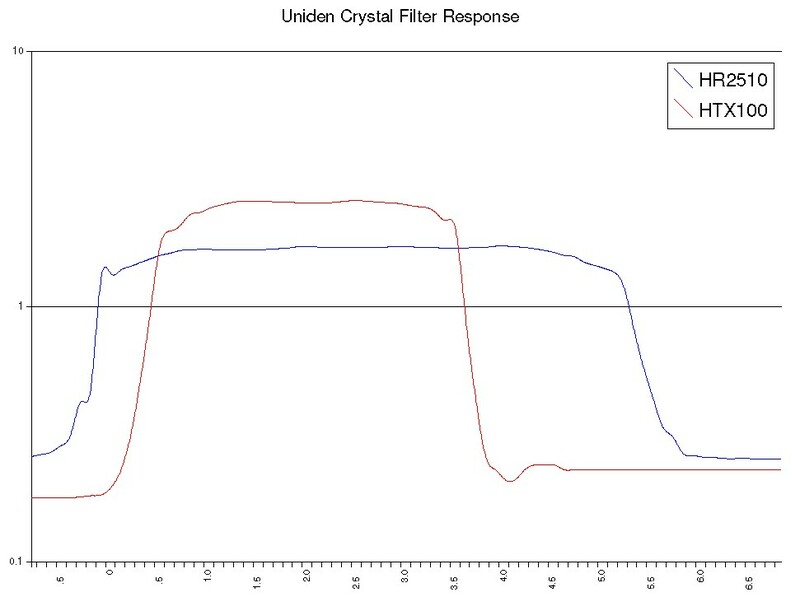 This effect will be mitigated somewhat in the HR2510 due to the fact the the transmitter uses low-level modulation for AM and the signal is bandpass filtered by the IF crystal filter, as opposed to the classic high-level modulation that is used in older AM transmitters, but the result is still not good. Click HERE for a very good animated graphic of what happens when you overmodulate, courtesy of Williamson Labs. Use a scope to set the AMC to 100% modulation and leave it alone. A scope is also the best way to set the ALC. Probably not worth it, especially with the solid-state amps that are out there on the market. An old rule-of-thumb is that it takes about 6 dB to make an S-Unit. A 3 dB increase in power is a doubling of power output. So if you double your output, you will see half an S-unit on the other end. An increase of 5 or 10 watts just isn't enough to notice under most conditions. If you get an external amplifier, just make sure you get one that is actually linear; many of the cheaper so-called 'linear amplifiers' operate in a class-C mode with no bias, and splatter the band horribly when used for SSB or AM. The worst offenders seem to be the ones that resemble a cigarette carton with a heatsink on the bottom; avoid these like the plague. I use a Texas Star DX400 (now called the EX400), and it seems to do a good job. Make sure any amplifier you use is specified for class AB1 SSB/AM operation. Sometimes the only way to know for sure is to physically check: take the cover off and apply power to the unit; pull the TR relay manually by grounding the collector of the keying transistor, and check with a voltmeter for .6-.7 volts DC at the base of one of the PA transistors. If you have 0 volts on the base, it is a class C splatterbox if used for SSB or AM, and should only be used for CW or FM. Click HERE for a good explanation of power amplifier classes of operation; this description discusses tube amplifiers, but the concepts are the same for solid-state amplifiers. My philosophy is that unless you have been to engineering school and have access to CAD equipment and network analyzers, don't dink with the RF strip. The engineers that designed the thing probably have more education and resources to do the job right than you or I. That having been said, the Better High Power Mod on Rogerbird's page does seem to have some merit. My transmitter seemed to need the extra gain that this mod provided in order to get decent power out on 12 meters after I installed my Chipswitch/12 meter mod. I did not, however, swap out the PA for an MRF497 as described. Be careful how high you set the AM power, also. There is only so much 'headroom' in the transmitter strip, and too much AM power will cause signal clipping and distortion. The result will be less than 100% modulation, but with clipped audio that will generate harmonics and splatter. Don't rely on a modulation meter, the only way to see what is really going on is to monitor the RF output with a scope. I'm currently investigating a more readily available part for this mod. It seems worthwhile, but I'm not sure what the point of removing D101 is; this diode provides AGC control to the front end, and would seem to leave the radio more susceptible to front end overload if removed. I plan on leaving it in. If anyone has any interesting mods that are not covered here or on Rogerbird's page, please contact me (remove the obvious spamblock). I would like to see them. All Articles and Pages are © Copyright 2001, all rights reserved, by Jim Shorney (except where noted). HR2510 and President are registered Trademarks of Uniden Corporation. Realistic and HTX100 are registered Trademarks of Tandy/Radio Shack. All other Trademarks and Copyrights are those of their respective owners. The contents of this page are provided for educational purposes only. All information contained herein is provided as-is, without any warranties express or implied, and is accurate to the best of my knowledge; however, the author assumes no liability for lost/damaged sanity, time, productivity, or property resulting from the use of information contained in this page. The modifications provided on this page may void any existing manufacturer and/or vendor warranties and invalidate the F.C.C. type acceptance of the HR2510 and HTX100. The author is not responsible, and assumes no liability for any fines or penalties imposed for illegal operation resulting from the modifications on this page.